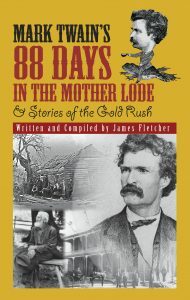 Mark Twain's 88 Days in the Mother Lode - Jim Fletcher's book is a best-seller! 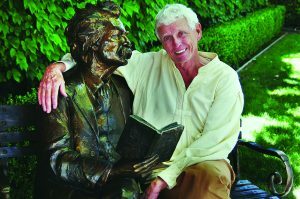 Jim Fletcher, “official storyteller of Calaveras County,” photographed with a bronze statue of Mark Twain at Camps Restaurant in Angels Camp, Calif., where he originally gave a weekly presentation on Twain’s “88 Days in the Mother Lode.” His free Twain Talks are now at Manzanita Arts Emporium in Angels Camp every Thursday at 11 am. Jim Fletcher had a vision — develop Mark Twain’s presence in Angels Camp and they will come–the history buffs, the literary lovers, the readers, and admiring fans. He was right. Not only did Jim write the book that needed to be written about Twain’s brief stay in the Mother Lode and the famous author and storyteller’s resulting career launched by a little frog story, but a film resulted, inspired by Jim’s talks at Camps Restaurant. John C. Brown and Bert Simonis produced and directed a PBS-aired documentary about Mark Twain called 88 Days in the Mother Lode: Mark Twain Finds His Voice. Both the film and the book are available online and in the Manzanita Arts Emporium in Angels Camp. Visit Jim on a Thursday at 11 am in the emporium and be prepared for a fascinating journey into the past as Jim takes you into Twain’s world of the West. It’s a FREE program.